House, three bedrooms, three bathrooms, sleeps up to six. GO GREEN - SIMPLY PARADISE IS NOW SOLAR POWERED! Nestled in the Chocolate Hole harbor, Simply Paradise is the ultimate in affordable beach cottages. The perfect spot to kick off your shoes and relax during your restful week in St. John. This three bedroom, three bathroom air conditioned cottage overlooks Chocolate Hole Bay with southerly views towards St. Croix. Through the stone arches of the living room you will find a comfortable sitting area as well as a dining area to enjoy all of your Caribbean meals. The master king bedroom offers a stunning view overlooking Chocolate Hole. What a perfect sight to wake up to in the morning! Simply Paradise also has a brand new 4 person Jacuzzi. The perfect spot to spend your evening underneath the stars. We visited for a week with family in late March/ early May, and to say it was spectacular is understating it. If you want an exotic location without feeling like a tourist this is it. Simply Paradise is a lovely, comfortable home with a postcard view of Chocolate Hole Bay. We very comfortably had 6 adults and two little kids share the 2 upstairs bedrooms and the fully accommodating suite below. The kitchen, spacious living room, sun room and dining area are perfect for a vacation stay. Every morning I was able to brew a fresh pot of coffee, take a cup to the deck and just sit back in a chair with my feet up chilling to the sunrise and the many birds who live in the jacaranda trees by the railing. Cruz Bay has fun restaurants, bars, and fantastic shopping within a 10 minute cab ride from the house and easy walking all around the quaint town, and the beaches of St.John and the nearby BVI are unbelievable ! 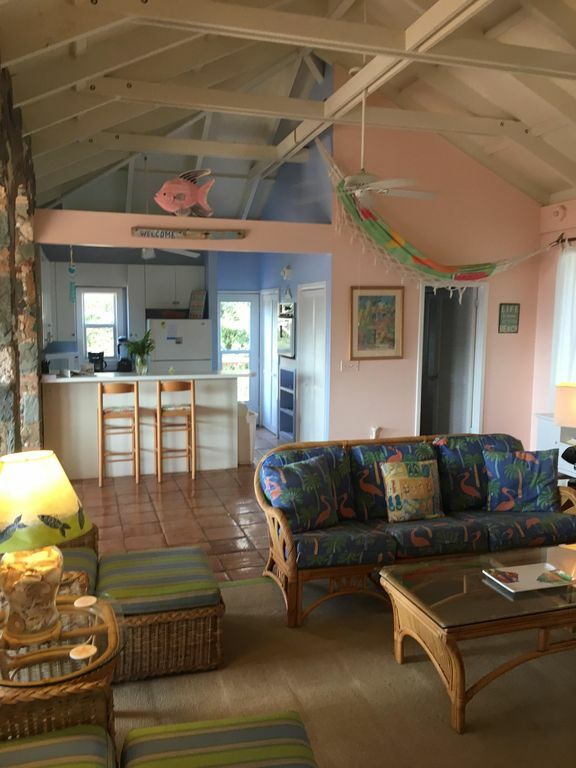 St. John has a super cool vibe with everything you could want for a relaxing vacation, and Simply Paradise is a place that makes you feel at home in the best vacation spot on the planet ! Finest vacation we've ever had and very much hope to come again! We stayed in Simply Paradise this past April and it was fantastic! Perfect location, great views, nice and cool(ac worked great!) had everything we needed, plenty of space and our boys (6 and 3) loved the kids room and all the toys that were there! This kept them busy while we enjoyed the morning view with our coffee on the deck. Hot tub was great as well and we took advantage of it almost every day! The only complaint (if you can call it a complaint...we were in paradise!) was there were only 4 beach towels for the 4 of us all week...they dried off every night but were pretty salty sandy by the 3rd day. There is a washer and dryer but we didn't want to spend the time waiting for them to get washed/dried before heading out for the day. We ended up getting a few of out own towels for the week. Other than that a perfect 10! Great View & accessible location! We stayed here with our 2 children (14) & (9). The kitchen is fully stocked. We prepared every breakfast and dinner at the house. The market is right down the road and we grilled on the deck every evening. The owners have graciously supplied beach chairs and towels. They also have snorkel gear and beach toys which saved us rental fees. The house is very clean and spacious. The location is 5 min into Cruz Bay and accessible to all main roads. We can't say enough about the view. It's a beautiful view of Chocolate Hole. We enjoyed the hot tub & watched the cruise ships sail by each evening. I have stayed at this house 7 times in the past 6 years. It is in a quiet neighborhood located above Chocolate Hole and walking distance to the Westin. 5 min drive to cruz bay and 10 more minutes to the beaches. The house has such a great feel with extra fun things such as snorkeling gear, toys, kids stuff, etc. Most of the time spent here is either out or on the wonderful back deck, complete with hammock chairs, a grill, table, and a HOT TUB. Cannot recommend this house enough. Went for a long weekend to run 8 Tuff Miles and it was the perfect place to relax both before and after. Open floor plan with large common area to play a game with the rest of the group or find another spot and relax or read a book. The kitchen was well stocked and we cooked several big meals together. But the best part were the views on the deck that goes the length of the house. Expansive across the entire bay at Chocolate Hole. It's one of the main reasons I keep going back there. Easy to get to and then only a 5 minute car ride to the bars and restaurants in Cruz Bay and this place has everything I'm looking for. Highly recommended! We LOVE Simply Paradise! My husband & I have been to St John 3 times and have always stayed at this wonderful house. This time we traveled with our 10-month-old daughter as well as our friends & their 10-month-old. The house was perfect for us. It's a great location & an easy drive to restaurants and all of the beaches. The kitchen is well stocked for cooking at home, which we did twice. The porch is perfect for hanging out in the morning, and the hot tub was a welcome way to end the day after the girls were in bed. Although, I have to say that the hammock swings are the best part of the deck at any time of day - especially when watching the sunset!